Information technology is a now a major part of the modern world and access to the internet is becoming more and more important to being a part of modern society. Access to the internet brings many benefits in terms of access to a broader community of friends, opportunities for learning and increasingly a number of web providers are taking account of the needs of people with learning disabilities when providing content. As well as the benefits however, there are also risks – the potential for cyberbullying, online grooming and risk of exposure to inappropriate content. 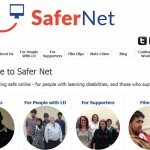 In response to these risks, Respond in partnership with Safer Net a national network of groups and campaigners, have set up a website to offer advice and guidance to people with learning disabilities on how to use the internet and world wide web safely. On the site, there is information directly for the sue of people with learning disabilities, for example the Respond Action Group’s Ten Tips for staying safe online, guidance on how to avoid mate crime and a developing glossary of confusing words that are associated with new media. The site also has a section for supporters where there are also top tips about how organisations need to develop clear Social Media policies and carry out risk assessments for the people they support, but also how staff and family members have a responsibility to get to know a bit about how the internet and social media work in order to provide the necessary support. The site is developing over time and new resources will be added as they become available.